Salaries, Timekeeping and FLSA Overtime Regulations: Check Your Tech! Last week, the Federal Government announced changes to overtime regulations. Many employers must decide on how to comply with these changes. With the advent of TV commercials from law firms offering workers a chance to report wage and hour issues, FLSA overtime regulations must be followed closely. I called one of our favorite clients to ensure they understood the overtime changes and implications t o their business. They are a premier, dynamic IT Consultancy; once we covered the regulatory stuff, our chat shifted to technology changes that may be triggered by the regulatory change. We discussed timekeeping systems for a while; companies are figuring out the best way to handle impacted employees, and their timekeeping systems will (or should) have the data managers need to support decisions. For example, salaries below the threshold ($47,476 effective December 1, 2016) don't have to be increased. You may decide to calculate the equivalent hourly rate that would pay the same dollar amount...with the same work schedule (including typical overtime hours). Having a history of hours worked would be invaluable in that analysis. Anyway, consider the following functions of a great time keeping system. 1. Ability to store and produce historical data and reports for at least 3 years back. Check the regulations in your state; most require at least a 3 year history (system or no system). Imagine a wage and hour audit with no history - not good. 2. Accurate handling of pay codes. Problems with calculation of overtime? Including PTO or Holidays in overtime calculations? Can't get shift differentials right? Again, not good. Any great system should limit access to time "punches" based on a user's role. Access rights should follow the organization structure, granting the right access to the right people. 4. Automated support for approval process. This goes hand-in-hand with role-based security. Are employees able to edit their time after it is approved by a supervisor? Can edits be done after payroll is processed? Think through the business rules and needs carefully. Wow - another interrelated function. The user ID used to make any data additions or changes should be logged in the system. The time the change was made should also be logged, and able to be reported on. 7. Ability to limit or authenticate employee's location when punching time. If your hourly employees can punch time from home when they should be at work, you have a problem. Enough said. Timekeeping should be reliable and easy. 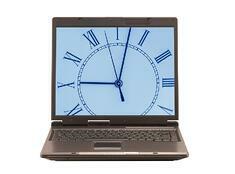 Treat your timekeeping system and its data as you treat your personnel records. Check your handbook policies for alignment with your timekeeping needs.